This is probably the most important graph in the current energy debate. I wonder how many of the Irish media will publish it ? Thanks to Euan Mearns. The Y-axis shows residential electricity prices for the second half of 2014 fromEurostat. 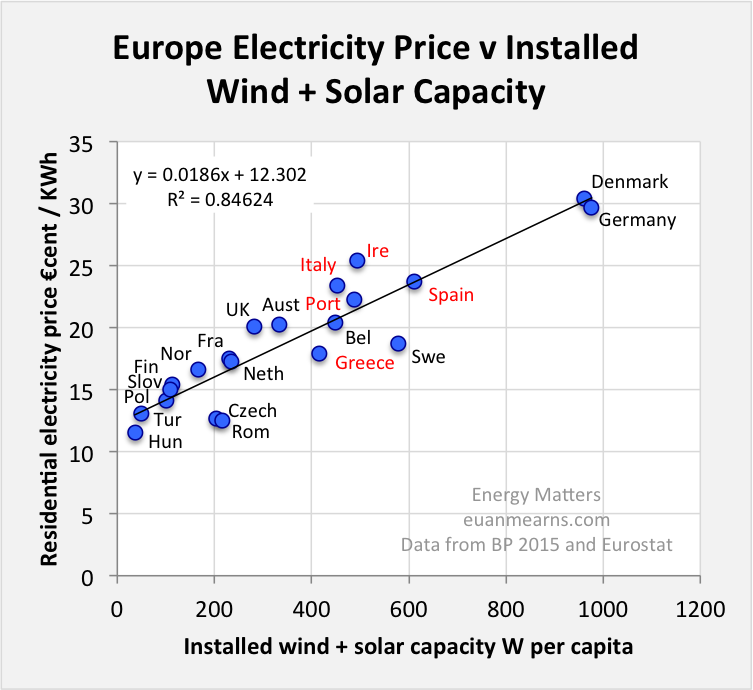 The X-axis installed wind + solar capacity for 2014 as reported in the 2015 BP statistical review normalised to W per capita using population data for 2014 as reported by the UN. Correlation to this extent cannot be dismissed as spurious. Fortunately, Ireland can soon regain its "Top of Class" status as it is Government policy to double the renewable energy contribution as quickly as possible (think SID). So don't rest on your laurels, dear Danes and Germans, Hibernia is on the march! Thirty cents a unit is a pittance to the prosperous post-austerity Irish - the Government has spoken. If one thinks of this logically, renewable energy would only work if it allowed fossil plant to be shut down. There are 2 ways it could be shut down, 1) permanently or 2) temporarily. No 1) would see a real saving in conventional generation's fixed and variable costs, plus the sale of the ground for other uses. Staff would be made redundant, capacity payments would cease. No 2) would only see a saving on the variable cost of fossil fuel saved, everything else would remain including administration, rates, wages, insurance etc. Nothing else is saved except the fuel saved when the wind blows. Therefore when 100 mw of wind is commissioned, all existing plant must be kept and an extra (80 to 100 ) mw of fast acting plant must be added to the total capacity. No 1 does not happen, It's No 2 which always happens, therefore the more wind energy is installed the higher electricity prices must go to keep all generators viable. Ireland now has 10,000 mw and Eirgrid's 2010-2016 adequacy report aims for a final total of 15,000mw. The above graph gives the Irish price @ 24 cents, now do the maths 24 x 15100/1000 = 3.24 cent when they are finished with it. Assuming Denmark and Germany pull back, Ireland could then have the highest electricity prices in the world. This in a country that always invested heavily in education. We see in the pages of this blog, that something has persuaded governments of most democratic countries and some undemocratic ones to intervene with subsidies in free trade. They have been given a scare that the earth is in the process of catastrophic warming as a result of co2 which is expected to reach a climax in about 200 years. I don't buy it, nor the scare that fossil fuel is about to run out. but if it is true, then the use of intermittent non-synchronous renewable electricity generation fed into a fossil fuel grid demonstrates just how silly policy makers have become. The 2008 economic crash resulted from lenders of depositors money (banks) believing that unrealistic wealth creation adventures by the carefree trill seekers was real. Society has a safeguard in place to protect depositors, “ regulators.” The entire edifice is vested in a few individuals. In the Irish boom/burst, the financial regulator failed miserably and I can honestly say having met the Irish Energy Regulator for over an hour in 2010, that he will not intervene in the green energy bubble, or give an opinion to warn anyone of impending disaster. Inept regulators have no roll to play, forget about them. The entire financial system relies on the credit/repayment model and that model relies on the skills of lenders. If they are badly chosen, they will lend to unsustainable borrowers to the exclusion of the prudent and an economic collapse on a world wide scale will ensue. Greece is on life support, China has just devalued its currency hitting those holding their money hard. Problems in Brazil too. In Ireland the milk price looks like it will follow Britain downwards hitting farmers and the value of food exports. Oil and Iron ore (key markers of economic health) prices are at rock bottom. You will probably say that there are plenty of new cars around and the occasional new truck, but where are the factories, the manufacturing, the wealth creation? Houses? Government's answer is to create vast amounts of electrical generating plant of all descriptions as fast as it can be built, but the resulting power will be the most expensive in the world. A wise sensible free society really cannot go broke, a stupid, silly ignorant society that doesn’t not go broke either is very lucky or has generous neighbours. The goods, services, pensions and other benefits we enjoy all have to be worked for by some one, somewhere. Government is moving to gimmickry, in every area. TV stations, Radio stations, the Sporting organisations are now mostly being sponsored from our electricity bills by the likes of Eirgrid who can't believe their luck. The traditional remedy for unemployment “war” appears to be off the table for 10 years at least. So economic collapse, where the things we thought were valuable are worthless can't be ruled out. If I am wrong and anyone can be wrong, why is the world wide interest rates have been at an emergency low for more years than anyone can remember? Due to the hike in the gas price and the limited amount of existence of fuel, people prefer to switch to the electric vehicles. Yet, it is also essential to have sufficient amount of electricity. Production of electricity from the water is not enough at all rather it needs some more resources also like solar, wind etc. Moreover, the installation of more wind or solar plants should help in decrease the price the electricity but it is happening reverse. We can clearly notice that the electric price is increasing day by day. Thanks for providing the info through graph.